With today's high temperatures predicted to be in the 90's, Bill and I headed to Palmer Park early - 7:30-ish - before it got too hot. We were going to try and locate a multi-cache (five geocaches with the first leading to the second; the second to the third, etc.) but could not locate the first leg after looking for over an hour so gave up - wondering if this geocaching hobby was really for us after all. 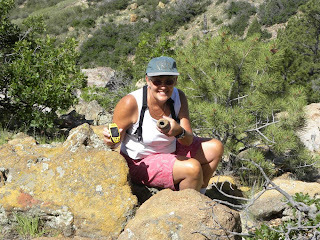 Since we still wanted to hike, we decided to look for another cache on the north end of the park. We parked the van, marked the spot on our GPS, and set out to look for the cache. According to the GPS it was just .5 miles from our parking spot - as the crow flies. Unfortunately, you can't get there the same way the crow does! We climbed down to the Templeton Trail. 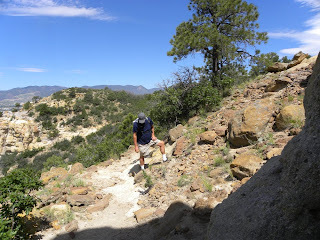 It wound around a beautiful canyon and around again the other way until we can to a spot with a breath-taking view of Pikes Peak about 2 hilly, rock-climbing miles from the car - as the old people walk. We looked and looked for the cache. It was supposed to be just off the trail in a small unique container. Just as we were ready to declare defeat - our second in one day - I decided to check for the umpteenth time around the rocks nearest to the coordinates. I looked under two large rocks and didn't see anything but another small rock which I reached to move and out fell the log and a pencil. I had found the cache! 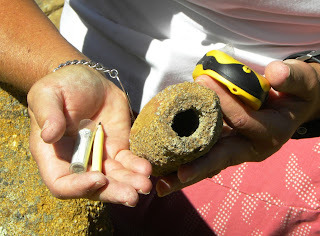 The container was unique as cache containers go - but looked just like the million or so other rocks on either side of the trail. We signed the log and headed back to the car feeling a little better about our geocaching abilities. We've now found 10 of 13 caches. This is Bill looking for the cache. The views of the mountains were drop-dead gorgeous. 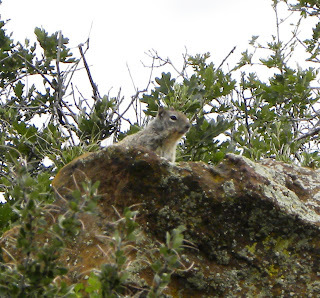 "Marmots typically live in burrows, and hibernate there through the winter. Most marmots are highly social, and use loud whistles to communicate with one another, especially when alarmed." The name marmot means "Alps mouse." They eat grasses, berries, lichens, mosses, roots and flowers. We were able to take a shorter path and arrived back at the car about 3 hours after we parked it. The temperature was beginning to rise into the high 80's and we decided to call it a day. The ANA Summer Seminar has been in full swing for the last two weeks so we have entertained son John and his friends several evenings. It has been great fun spending time with my youngest child. He just broke off his relationship with girlfriend, Anne, but seems to be fine about it. I wasn't sure I liked her anyway - at least not with John - so this, in my opinion, is for the best. 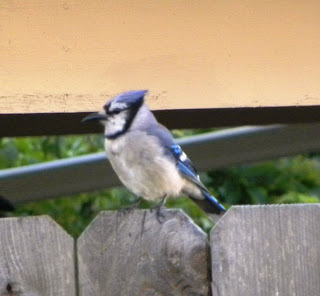 Yesterday I saw this Blue Jay in the yard - the first one this year. They are beautiful birds and always remind me of my earlier life in Penn-sylvania where they are more plentiful. 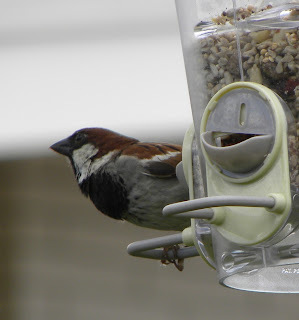 We've seen lots of English (or House) Sparrows at the feeders. This one is the male. 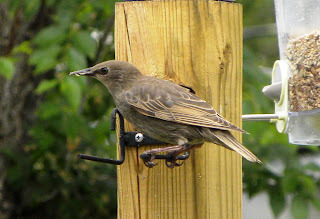 The female does not have the black bib. 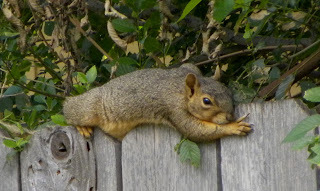 Mr. Squirrel looked like he was taking a nap on the fence. He was just laying there longing to get to the feeders. I wish they made a Starling baffle to keep these loud, dirty birds away. I believe this is a young female. Tonight I'm heading to Lucy's house for a rousing game of Bunko with girl friends from Einsteins. I must remember to take my roll of toilet paper. Great Excuses for a Hike!